As a young child I used to watch my father cook and help my mother bake. This explains why I find cooking relaxing after a long day working at the computer. As the primary evening cook in my household, I decided to purchase some iron cookware pans. I was used to them from my childhood. But in talking to my Mother, she stopped me from purchasing them. She said that I could take some of the old cast iron ones they weren’t using anymore. This was great as it saved money, and saving every penny is useful when starting a family or a new hobby. My wife’s high school calligraphy set. You might be wondering what all this has to do with inkstones (simplified Chinese: 砚; traditional Chinese: 硯; pinyin: yàn) (simplified Chinese: 砚台; traditional Chinese: 硯臺; pinyin: yàn tái) (Japanese: 硯 suzuri) (Korean: 벼루 byoru). Well, just like my cast iron cookware which is used and is over 45 years old, both of my inkstones are used. One of the inkstones is that which my wife used as a child in school. The other one belonged to her Grandmother. My wife’s inkstone is the basic design which every school child begins using. Over 20 years old, it is the primary stone I take to calligraphy class. Her Grandmother’s inkstone is just beautiful, it looks like a mini mountain. It was made from one stone, cut and carved so that it has the base as the inkstone and a cover. My guess is that it’s over 80 years old. Here are a few things to look for when purchasing an old and/or used inkstone. 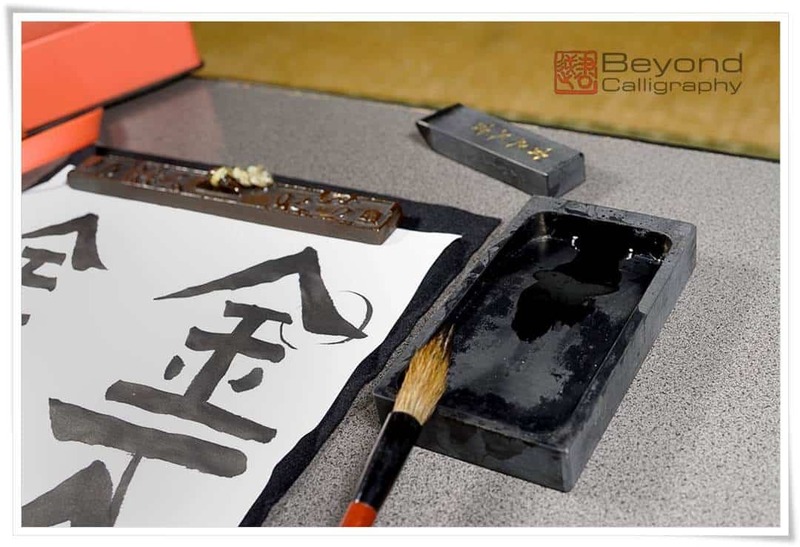 If purchasing from the original owner, ask where in Asia the inkstone was purchased or made. This is to determine the properties of the stone. Unlike China, Japan is not naturally rich in the tufa and argillite rocks that make fine inkstones. While you can find inkstones made out of other materials such as ceramics, metal, gemstones, or even lacquer-coated wood, it is best to look for inkstones made from natural stone. Recently a ceramic ink stone has become popular. While they are light and inexpensive, they do not have the right surface texture for grinding ink and are difficult to use. In general, one should always purchase a natural stone. How to further examine an inkstone before purchasing? 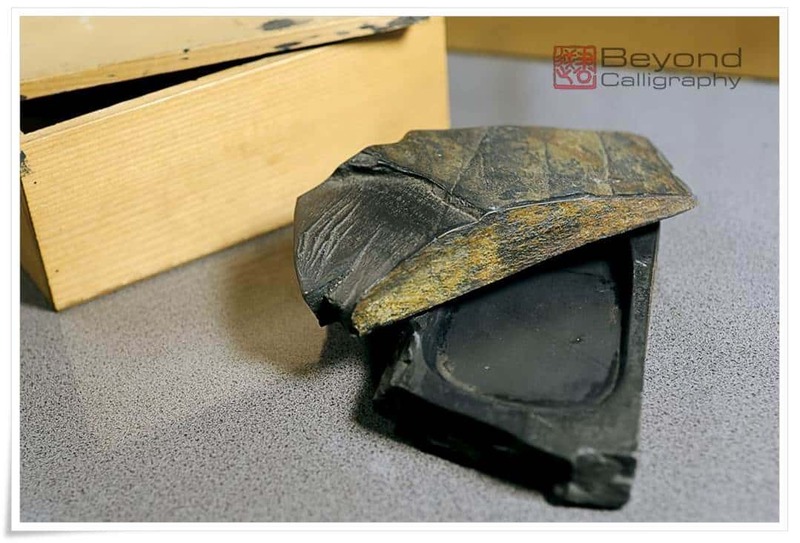 Inspect the inkstone to make sure there are no hairline cracks, scratches, chipping, etc., as this may result in the inkstone breaking in the future. If you submerge the inkstone in water, the color will turn darker so that you can examine it closely for cracks and other defects. Test the inkstone’s grinding surface. Run your finger across the grinding surface, the surface should be hard and very smooth. The smoother the grinding surface, the more consistent the quality of ink you will get. Stay away from Inkstones with a rough surface as it will chip the ink during rubbing. The last test involves water or your breath. If it is cold enough, blow on the inkstone’s grinding surface and watch your breath. If your breath stays on the stone for a long long time, it means the stone does not easily absorb water. Thus the inkstone is of good quality. If you know of other places or ways to find used inkstones, please leave your comments below. ← How are Kana Shodo Culture, the opera “ Madame Butterfly ”, and Japanese Aesthetics related?